500 lbs working capacity and 800 lb. lifting capacity, high strength tubing and precision metal gear.. The fixed mount jack with drop leg is suited for the heavy-duty applications. This square tube jack ..
15" of Travel. Finish: primed outer, zinc inner tube. Corrosion proof cap is removable for gear lubr.. Rolled acme threads and anti-friction thrust bearings provide smooth cranking and long cycle life. H..
F2 jack 1600# twin track Max Load: 1600 lb.Description: Twin Track (Dual Wheels)..
F2 jack 1600# wide track Max Load: 1600 lb.Description: Wide Track..
Swing-away design, with bolt thru mounting and dual wheel. Stable formed heavy-gauge steel construct..
Swing-away design, with bolt thru mounting. Steel construction with zinc finish. Travel: 10"Max Load..
Swing-away design, with bolt thru mounting. Steel construction with zinc finish. Travel: 12"Max Load..
Sidewind handle. Bolt on retaining ring swivel bracket assembled. Fits up to 3" x 5" tongue. Include.. 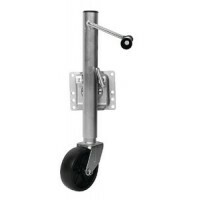 Fits most Fulton jacks and CE model casters with a 6" wheel except F2 series. Dia. : 6"..
Swings from vertical position to horizontal for fast getaway. Spring loaded latch locks and releases.. Fixed mount jack with drop leg. Suited for heavy duty applications and fits trailer frames up to 3" ..